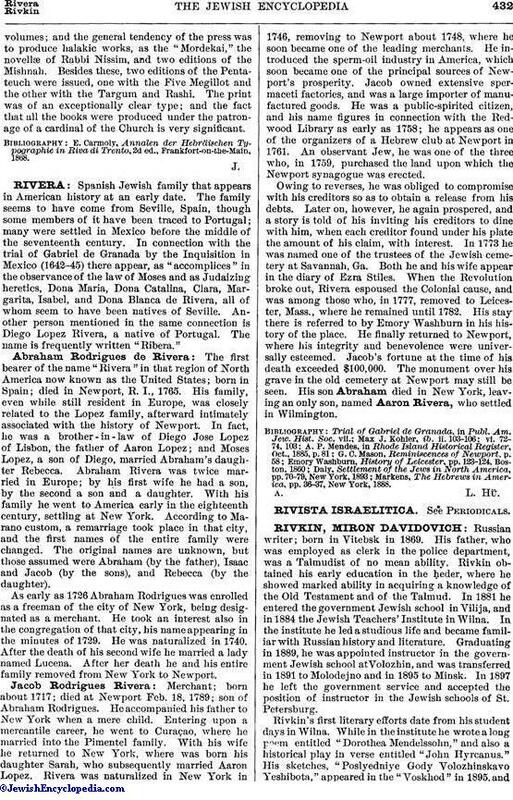 Spanish Jewish family that appears in American history at an early date. The family seems to have come from Seville, Spain, though some members of it have been traced to Portugal; many were settled in Mexico before the middle of the seventeenth century. In connection with the trial of Gabriel de Granada by the Inquisition in Mexico (1642-45) there appear, as "accomplices" in the observance of the law of Moses and as Judaizing heretics, Dona Maria, Dona Catalina, Clara, Margarita, Isabel, and Dona Blanca de Rivera, all of whom seem to have been natives of Seville. Another person mentioned in the same connection is Diego Lopez Rivera, a native of Portugal. The name is frequently written "Ribera." The first bearer of the name "Rivera" in that region of North America now known as the United States; born in Spain; died in Newport, R. I., 1765. His family, even while still resident in Europe, was closely related to the Lopez family, afterward intimately associated with the history of Newport. In fact, he was a brother-in-law of Diego Jose Lopez of Lisbon, the father of Aaron Lopez; and Moses Lopez, a son of Diego, married Abraham's daughter Rebecca. Abraham Rivera was twice married in Europe; by his first wife he had a son, by the second a son and a daughter. With his family he went to America early in the eighteenth century, settling at New York. According to Marano custom, a remarriage took place in that city, and the first names of the entire family were changed. The original names are unknown, but those assumed were Abraham (by the father), Isaac and Jacob (by the sons), and Rebecca (by the daughter). As early as 1726 Abraham Rodrigues was enrolled as a freeman of the city of New York, being designated as a merchant. He took an interest also in the congregation of that city, his name appearing in the minutes of 1729. He was naturalized in 1740. After the death of his second wife he married a lady named Lucena. After her death he and his entire family removed from New York to Newport. Merchant; born about 1717; died at Newport Feb. 18, 1789; son of Abraham Rodrigues. He accompanied his father to New York when a mere child. Entering upon a mercantile career, he went to Curaçao, where he married into the Pimentel family. With his wife he returned to New York, where was born his daughter Sarah, who subsequently married Aaron Lopez. Rivera was naturalized in New York in 1746, removing to Newport about 1748, where he soon became one of the leading merchants. He introduced the sperm-oil industry in America, which soon became one of the principal sources of Newport's prosperity. Jacob owned extensive spermaceti factories, and was a large importer of manufactured goods. He was a public-spirited citizen, and his name figures in connection with the Red-wood Library as early as 1758; he appears as one of the organizers of a Hebrew club at Newport in 1761. An observant Jew, he was one of the three who, in 1759, purchased the land upon which the Newport synagogue was erected. Owing to reverses, he was obliged to compromise with his creditors so as to obtain a release from his debts. Later on, however, he again prospered, and a story is told of his inviting his creditors to dine with him, when each creditor found under his plate the amount of his claim, with interest. In 1773 he was named one of the trustees of the Jewish cemetery at Savannah, Ga. Both he and his wife appear in the diary of Ezra Stiles. When the Revolution broke out, Rivera espoused the Colonial cause, and was among those who, in 1777, removed to Leicester, Mass., where he remained until 1782. His stay there is referred to by Emory Washburn in his history of the place. He finally returned to Newport, where his integrity and benevolence were universally esteemed. Jacob's fortune at the time of his death exceeded $100,000. The monument over his grave in the old cemetery at Newport may still be seen. His son Abraham died in New York, leaving an only son, named Aaron Rivera, who settled in Wilmington. Markens, The Hebrews in America, pp. 36-37, New York, 1888.